Planted on the earth and conveyed to heaven. Saint Bendimianos* came from a wealthy and noble family of Mysia in northwest Asia Minor, and was born in the middle of the fifth century. At a young age he went to Constantinople in search of a virtuous monk to be guided by him in obedience. On a hill outside the capital, in the horizon, he saw a lofty mountain, the summit of which was enveloped in a cloud. When he inquired of this mountain, he was told it was Mount Auxentios, named after a holy man who struggled in asceticism on the mountain for many years. This mountain was a wild place, with rough and harsh terrain, containing steep ridges and precipices. He was also told that the place was bereft of all food and not able to support human life. They reported that there were only rocks there and dense forests. When Bendimianos heard this, he was filled with joy and gladness, for a place of such hardship and discomfort would bring sweet pleasure and rest for the soul, recalling the words of the Apostle Paul: "Whenever I am weak, then I am strong" (2 Cor. 12:10). The youth hastened to the mountain, therefore, as a thirsty deer to a stream, and came upon the venerable Auxentios (Feb. 14). Bendimianos immediately asked the elder to tonsure him a monk, lest his relatives find him and hinder it. Auxentios, perceiving his burning love and zeal, fulfilled his request and tonsured him a monk. The youth then made rapid progress in obedience and the virtues. Shortly after this, Auxentios reposed in the Lord. Bendimianos therefore found a rock below the cell of his elder that was rent asunder, and he built a small hut within it. There he dwelt for five years. The young monk lived there in extreme hardship and asceticism. 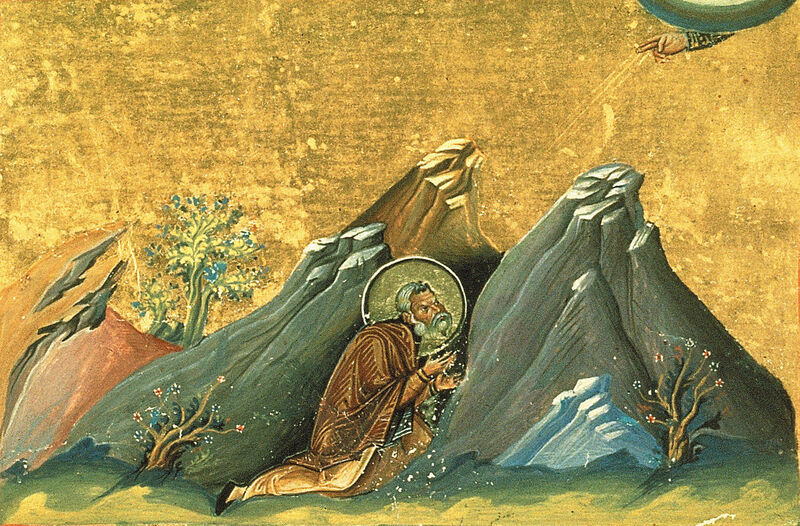 This was until Christ appeared to him, who told him to climb to the cave of Auxentios at the summit, where he should abide for the rest of his life. This was told of him for two reasons, first that the habitation of Auxentios never be desolate, and second that Bendimianos would not allow himself to be consumed by fatigue and debilitation. Bendimianos therefore ascended to the summit of the mountain, where he lived for forty-two years. There the wicked devil sought to not allow him to become a luminary to illumine the world with his wisdom and conduct. He gathered together many demons in his service to accomplish this. These wicked spirits would transform themselves into eagles, vultures and ravens, that would shout and cry out while he was praying. The longer he continued in his prayers, the more they screamed, as well as scraped, clawed and pounded the door of his hut. In return the Saint would chant louder and longer in defiance of their persistence. Eventually, seeing that all they sought to do was in vain, the spirits fled while the Saint was filled with the grace of the Holy Spirit. In time Bendimianos gathered disciples around him, and it happened one day that they became utterly deprived of bread. This caused the monks to worry and they wondered how they could survive. When they brought their grievance to their elder, he felt sympathy for them. He therefore spoke to one of them, saying to him to descend the mountain where he would find a man bringing them many loaves of bread. The monk hastened down the mountain in obedience. And indeed, in a wondrous manner, the monk came upon a man who was carrying the loaves. Then they all ate to their satisfaction, and gave thanks to God. Another time there was no oil left for the oil lamps in the church. Consequently, the ecclesiarch left the lamps unwashed and filthy. Bendimianos inquired of the ecclesiarch why he left the sacred vessels unwashed, and the monk replied that since they had no oil there was no purpose to wash them. The Saint therefore told him to mind his duty, and God would provide. He therefore cleaned and prepared the lamps as well as lit the fire, then the monks asked the elder where the oil was. The elder responded that the Lord would indeed provide. Within the hour, a stranger came in the company of his wife and children, who had come with beasts laden with oil. After the elder blessed the family, they departed in peace. By this the monks learned to place their hopes in God, and not to worry, for God would provide with all that was necessary. Besides his gift of prophecy and insight, Saint Bendimianos also was given the grace to heal the sick. He was distinguished especially for curing dropsy and those with diseased spleens. His compassion brought such speedy healings, that it is impossible to enumerate how many were healed by his prayers. Before his venerable repose, the holy elder advised his disciples to love God above all else, and to love one another. He also taught them to be charitable to those in need and to give alms to the poor. Then he enclosed himself in his cell and shuttered the windows. He remained enclosed there for many days, which caused his numerous disciples to be agitated, for it was his custom to always instruct his disciples in the divine commandments. Then certain of his disciples became anxious, for they feared that he may have died as they awaited for him to emerge. Unable to endure the long silence, they therefore forced open the window, and they beheld an astonishing sight. The elder had indeed reposed, but he was found kneeling as if in prayer. After the brethren wept sufficiently, they prepared his body for burial. They decided to bury him where he had dwelt for so long in a wondrous manner. Though many monks from the surrounding area desired to attend his funeral, few made it due to a heavy snow fall at the mountain's peak. He reposed around the year 512. Mount Saint Auxentios later would become a notable center of the monastic life. * Also spelled Vendimianos, Bendimianus, Vendimianus, Bendimian, Vendimian, Bendedianos, Vendidianos, Benedimianus.